1.1. To enter the competition entrants need to follow Map Mogul Ltd on Twitter @MapMogulLtd or Instagram @MapMogul2016. Entrants must like and retweet or regram the bespoke daily Map Mogul Ltd competition tweet or post including the hashtag #MapLifesLandmarks. 1.2. The winner will be selected at random based on entrant eligibility outlined below. 2.1. The Competition opens on 08.00am GMT Thursday 24th November 2016 and closes Sunday 27th November 2016 11.59pm GMT. 2.2. Entrants can enter at any point between these dates. 2.3. Entrants can enter the Competition once per day over the duration of the competition. 2.4. The Competition is only open to UK residents aged 21 or over, excluding employees and agents of Map Mogul Ltd and anyone professionally connected with the administration of the Competition. 3.1. 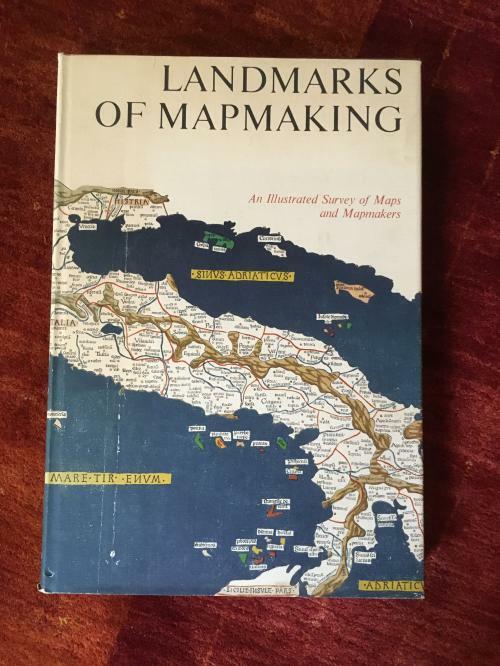 The prize for winning the competition is a copy of Landmarks of Mapping with preface by Gerald Roe Crone with maps chose by R. V. Tooley. Out of print. Valued at over £100. 3.2. The Prize is as stated and cannot be sold or exchanged for cash, goods or services. The Prize is not transferable. 4.1. You consent to your surname, photograph and basic information about you being disclosed on Map Mogul Ltd digital channels or other media if you win the Competition. 4.3. Competition winners will be contacted by Map Mogul Ltd. You must provide accurate contact details on notification, including a valid UK postal address for prize fulfilment. 5.4. We reserve the right to change the Competition rules and these Terms and Conditions from time to time. If we do so, we will always have the most up to date terms and conditions on this link and in the case of a discrepancy between these terms and conditions and those on this link, the link terms and conditions will apply. 5.5. All intellectual property rights in the images and materials on the Website, and used in the services provided by Digital Mums and no person may make any use of them without Digital Mums’ express permission. 6.1.3. any act or default of any supplier, which are beyond Map Mogul Ltd reasonable control. 6.4. You agree to indemnify Map Mogul Ltd against all liabilities, claims and expenses that may arise from any breach of your agreement with Map Mogul Ltd.